I am looking for a new template for my website with a animal theme (africa) or earth coloured appearance. Can you help? We will try to make one in the future. Is this Backwards compatible with 1.5 at all… Could it be? my site and would love something in that order. Good work on this one tho. I love the look of this template, but I am having trouble opening the templatedetails.xml file. I’m on a Mac and have downloaded all of the software that Joomla! suggested. Could someone help? Without that file, I can’t use this template. Thanks for the free templates really like them,thanks. Hi there i have a little problem trying this template, it dont shows my subitems menu, and i allready have put it on administrator consol to show subitems. but just dont go on. 1) For this theme. I like the TOP MENU (under the my home 2.0 banner), but it doesn’t show up on my site when I create it. 2) Also, how can I change the “my home 2.0” to a different word, for my site? 3) How can I insert “different text” in the cream color blurb that’s next to the couch in the banner photo at the top of the site? 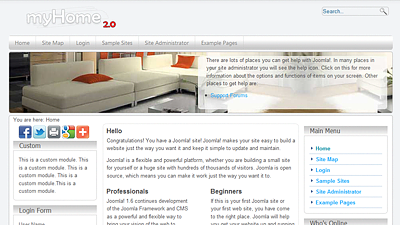 The TOP MENU that has the tabs: Home, Site Map, Login, Sample Sites, Site Administrator and Example Pages. I have found everything I needed thank you!!! **Still working on changing the logo. I have some questions that I haven’t yet been able to figure out. 1) Is there an easy way to change the social buttons? They are currently displaying above the login form, but I would like to swap out the print button with a LinkedIn button. 2) How can the article layout be changed? The template automatically sets them up in three columns, but the demo site shows only two columns. 3) Sub menu items are not displaying although I checked the menu manager, Main Menu module and the template to make sure that sub menu items were checked and set to display. What am I missing? These templates look great, and I am really hoping to get these things worked out so I can use it for my site. I would like to make a contribution for your efforts, please let me know how to do so.